Theresa Ganz's methodology is like making paper out of paper: she builds rocks from rocks. Heart of a Cave, her current exhibition at Peterborough's Evans Contemporary, comprises works executed in black and white digital photography, with one colorful exception. 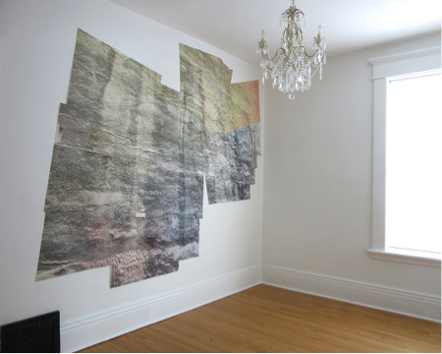 Her images represent caves, slabs of stone, and landforms—all assembled from photographs of geological formations taken by the artist. Generating in the viewer a curiosity to look deeper, to work out how it was assembled, Ganz’s postmodern practice makes meaning through the imperfections of mimesis and combination. The body of work in Heart of a Cave demands a close encounter with landscape, and careful reading. Panorama and Cave of the Heart are the exhibition's two largest artworks, but they operate differently within the gallery space. 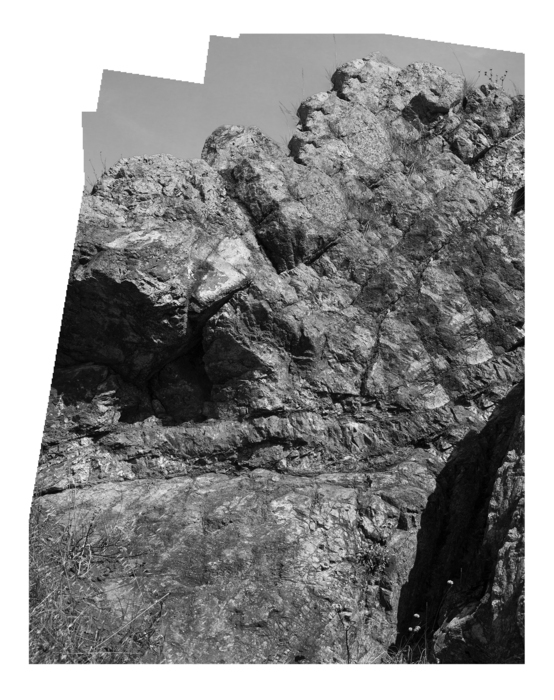 Where Cave of the Heart (at top) invites the viewer to peer into it, Panorama presumes a punk posturing with its shocks of electric orange and pink. It is playfully in dialogue with the dynamics of the space; it’s mounted directly to the wall it occupies and seems to be crawling up it or asserting itself onto it—alive, perhaps—and in progress. Images often dissolve upon a closer look; gestural paintings reveal brush strokes, billboards pixelate. In Panorama and several other works in the exhibition, rather than breaking down upon closer scrutiny, the image shifts, and one encounters the materiality of the photograph. Jagged edges where “stitching” software has lost its thread define the boundary between the wall and the work. 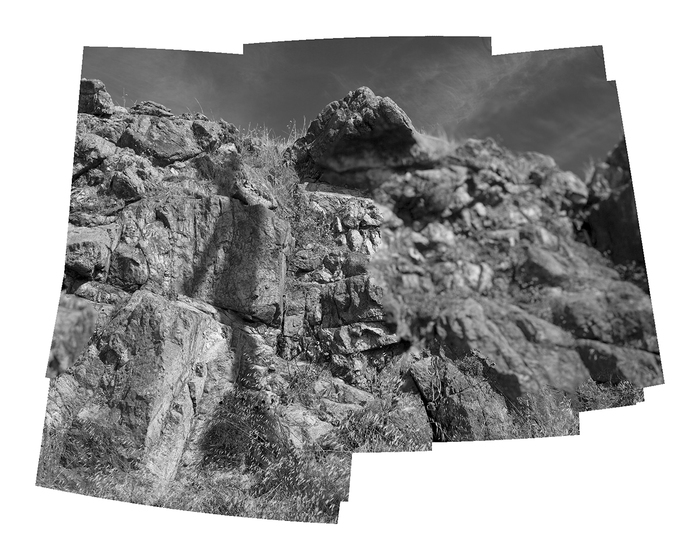 The details of rock surfaces are all there, but reorganized. These marks—like those jagged edges, juxtaposing clarity with blur—are signature traces of the images’ digital pedigree. 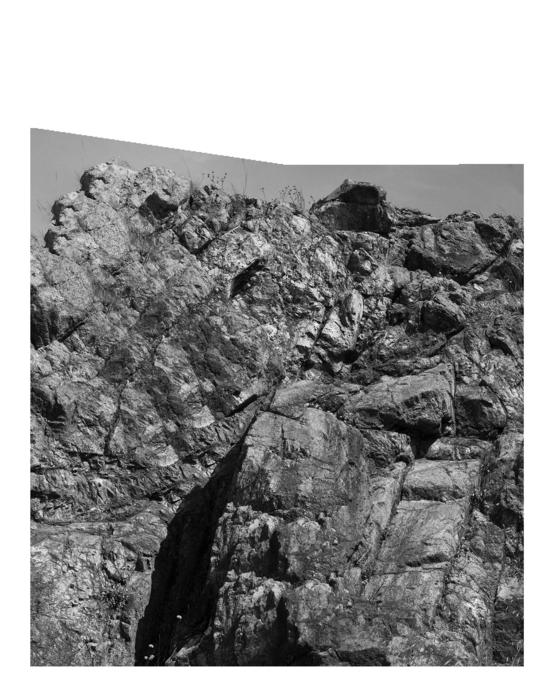 Landscapes assembled from photographs of landscapes—rocks from rocks—become animated, shifting the gaze constantly. Their irregular form somehow warps the picture plane just enough to disrupt its pictorial characteristics. Is that a waterfall? Is that a positive form or a negative space? Ganz negotiates her images’ edges either by cutting them with a scalpel before assembling or leaving visible the digital rifts generated by software interface slippages. Through this push-pull, there is an ongoing making of the subject via one’s own looking. Throughout, there is the deployment of “hide and seek”: Ganz inverts the images (positives and negatives) and separates them. The same forms reappear in different works, becoming archetypes within the logic of Heart of the Cave. What is a shadow here may be a white figure there, again tugging at the material reality of a digital practice. Peering closely at the layers of hand-cut photographs reveals tiers of texture. There are the pieces of physical photographic prints cut out, assembled, inverted, and layered. In the darkest parts of the Cave of the Heart, the texture of the rock formations read like elephant hide. The work itself is analogous to Dürer’s rhinoceros; there is a separation between experiencing the actual thing and the trying to reconstruct it in one’s studio. All of the correct elements are here, but there is something in the execution that is overly symmetrical; it becomes decorative. For Ganz, unlike Dürer, this invocation stirs up some necessary ghosts. Baroque forms and demeanor successfully undercut narratives of landscape as an ideological receptacle for an imperialist gaze. 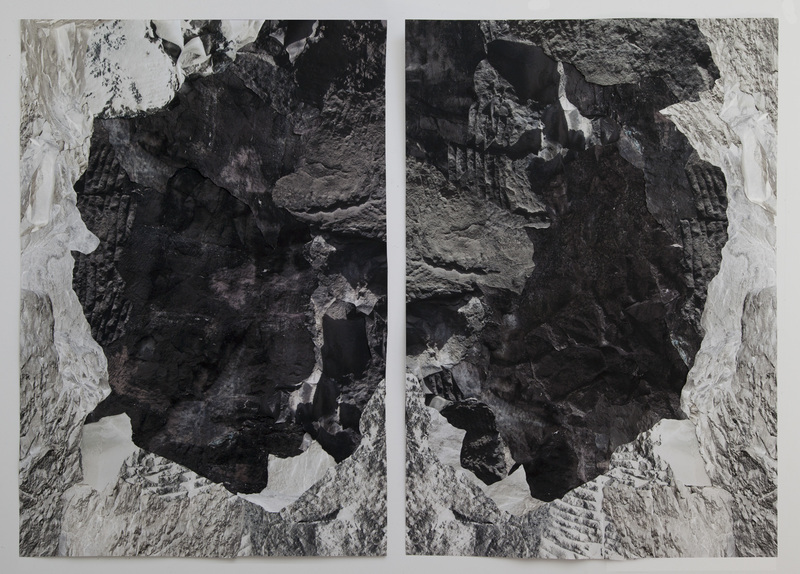 In his 1954 forward to A History of Infamy, Jorge Luis Borges wrote: “I would define the baroque as that style that deliberately exhausts (or tries to exhaust) its own possibilities, and that borders on self- caricature.” Ganz addresses landscape through a performative baroque, as she thoroughly works materials into new forms via physical and digital cutting and assembling. The materials are specific: photographs, yes, digitally manipulated and material, yes. If these rocks could talk. These rock formations are particular. 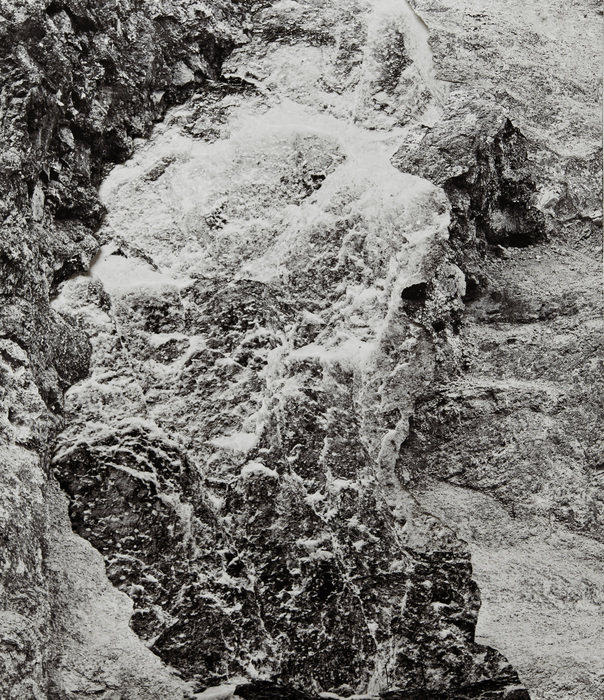 Ganz took her photographs of rocks in proximity to sites generations of people have worshipped; they are charged with cathexis. Ganz’s meticulous assembly and inclusion of detail (decorative nature, even) demands a close look—a very close look, at times bordering on claustrophobic. The outcome is a re-orienting relationship with landscape where the viewer no longer dominates, but is overcome, absorbed. It abides the excess described by Borges, and flattens the divide between nature and culture. Borges, Jorge Luis, and Andrew Hurley. 1998. Collected fictions. New York, N.Y., U.S.A.: Viking.